Arcade Fire in Montreal or Quebec City? Inform me about the next events for Arcade Fire. Enroll yourself to our priority waiting list for Arcade Fire to be alerted when new tickets are available. Filling this form doesn't engage you to any purchase. 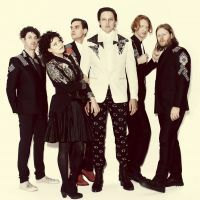 Arcade Fire will be back soon to perform in Montreal and Quebec City. The band will be performing at the Centre Videotron in Quebec City on September 5th, 2017, and then at the Bell Centre in Montreal on September 6th. Arcade Fire will release their fifth album entitled Everything Now on July 28th. This new tour, with Wolf Parade as the supporting act, will allow fans to hear those new songs. Don't miss the return of the Montreal band Arcade Fire, with tens of thousands of fans just waiting to applaud them !